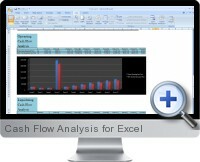 Cash Flow Analysis for Excel (Cash Flow Model) provides a variety of analytical methods for view current and future structures of a business. The cash flow analysis template utilizes data entered into one input sheet and provides subsequent analysis worksheets including Profit and Loss Statement, Operating Cash Flow, Liquidating Cash Flow and a summary reporting Dashboard. The Cash Flow Analysis allows to determine overall financial strength of the business, ability to meet current and future obligations (such as debt payments) and make future investments in assets. Furthermore, the cash accounting over time allows to visualize cash flow trends and periods of potential business risk.